Whether you need a location for a company outing, a conference, for seminars, presentations or incentives – the F60 is the perfect choice. This unique location is one of the most extraordinary spots in Germany. Without any doubt, the steel giant and the infrastructure of the visitor mine will arouse your client’s interest and motivate your employees and colleagues. Your guests will surely appreciate and remember this experience at the F60 for a long time. If you have an idea for a possible event at the F60, our team would be happy to help and support you with our extensive and flexible service package to guarantee the success of your event. Feel free do download our exposé with useful information about the F60 as event location and convincing arguments why you should consider planning an event at our visitor mine. Do not hesitate to contact us for further information or arrangements. Do you have a thirst for adventure? Are you willing to take a small risk? Do you think you are brave? 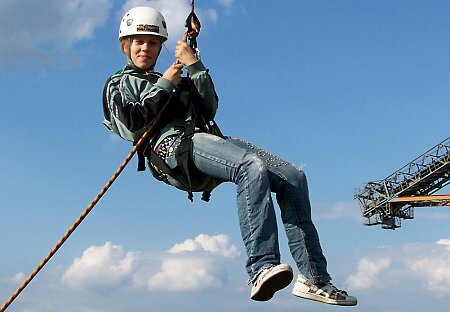 Then test yourself at the F60 and abseil down from breath-taking heights. The experienced team from Prima Abendteuer provide helpful support and professional advice and guarantee your safety and tested equipment. Once you’ve climbed over the bridge railing, you will feel the pure enjoyment of this unique experience – an experience you will remember for a long time. With powerful jeeps and nimble ATVs our guests will explore the former opencast mining area and the territory around the future Lake Bergeide, always accompanied by one of our guides. Don’t miss this opportunity to have a lot of fun when dashing over sandy dunes, rock-hard slopes, puddles and mud holes. A small picnic during the tour is possible.